I’ve argued for a number of years that individual sovereignty is a capacity that flows from God. Sovereignty is primarily a spiritual, rather than political, concept. We are each “sovereign” because—according to the “Declaration of Independence”—we are each endowed by our Creator with certain, God-given, unalienable Rights. I’m not alleging that the following comments are correct or even consistent. I’m only saying that they cross my mind as interesting questions or possibilities. Note that “a” is an indefinite article. It signifies one of many who are otherwise similar or even identical. According to the King James version of the Bible, the multitude accused the Messiah of claiming to be “a King,” that is to say, “a sovereign”—one of several, perhaps many, but not the only “King”/sovereign. When President Obama took his first public inauguration oath in A.D. 2009, Supreme Court Justice John Roberts “accidentally” misread the words of the oath. Later, Obama took the oath a second time in private with the correct words. Conspiracy theorists were incensed. They claimed that, clearly, this was evidence that Obama was taking one oath in public and another in private and that he was therefore occupying two offices, or maybe only the “private” presidency, or maybe . . . .
After a while the two-oath “conspiracy theory” of A.D.2009 disappeared under the tsunami of ongoing news. But guess what? 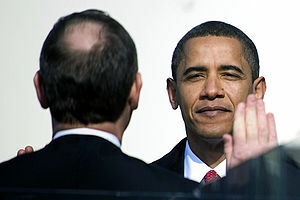 The Associated Press reports today that Obama will again take two oaths of office: one in private and another in public. The excuse seems plausible. The show must go on. For the sake of “show biz” (the Inauguration Ceremony) Obama will take a second oath so all the peons can see him do so on January 21st, even though he “actually” took the oath on the 20th. . But I am freakin’ amazed. Again, Obama is taking two oaths of office–one in private; one in public; one on each of two separate days. I’d very much like to see the exact words taken in his “private” oath of office.